Halloween is a fun time for the entire family to dress creatively. In fact, there are infinite ways you can coordinate family costumes. Some ideas require a lot of time and effort, and others you can throw together at the last minute. These family Halloween costume ideas will inspire you to think of new ways to venture out trick-or-treating as a unit and make plenty of people smile along the way. You can use clothing you already own, head to a thrift store, or sew some from scratch for this family costume idea. Don't forget about the accessories, like the strongest man's weight using balloons and painted PVS pipe. It's easy to put together a Wizard of Oz family, incorporating many articles of clothing from your current wardrobe. All you need to do is add in classic touches, like tin man's hat using a painted funnel, the scarecrow's body using ​some straw, or sparkly red shoes using red fabric and glue glitter. If you've ever enjoyed paper mâché crafts in the past, you'll love recreating this family of three bears and Goldilocks. If the youngest in the family is a girl, dress her up as Goldilocks for an extra cuteness factor. Sometimes dressing your family up as a group of clowns is as simple as painting your face white and adding red lips and a rosy nose. However, you can also opt to do another theme altogether, like sad clowns or scary clowns. There are tons of makeup tutorials you can look to for further inspiration. Follow these tutorials to sew a clown collar and cuffs as well as a clown hat. Movies always make for good family-themed Halloween costumes. Take your family back to an old classic by dressing up as Doctors Alan Grant and Ellie Sattler. For added cuteness factor, dress up the baby as a dinosaur and any older children as Tim or Lex. Is your family still obsessed with Pokemon Go and catching them all? If so, create a team of your kid's favorite Pokemon along with characters like Ash and Misty. The costumes can be easily sewn together using templates or bought online. This family Halloween costume idea is especially easy if you have ever taken a trip to Disney before. Chances are the entire family has a ton of memorabilia to make for a quick transformation. Just be sure to go over the top with accessories like fanny packs and mouse ears. 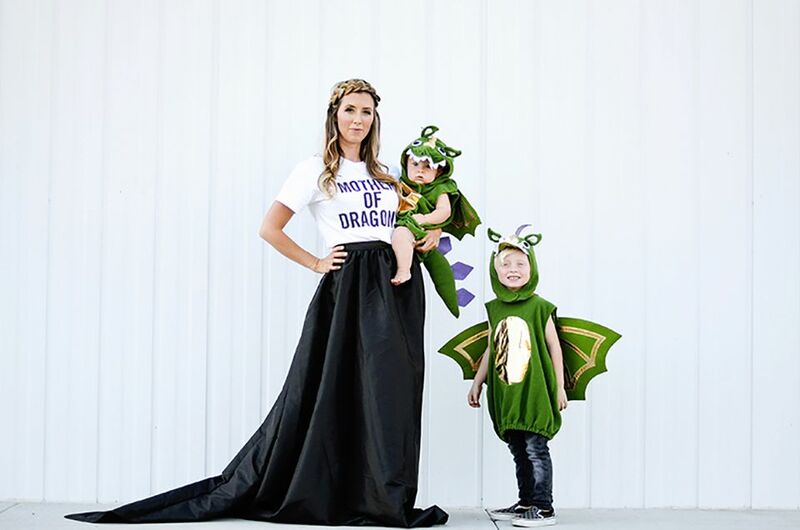 There is a wide range of Halloween costume ideas that involve Game of Thrones, but many of them are complex and would involve a lot of sewing. This rendition is a play on the mother of dragons and uses a graphic tee to make the point. Have you ever looked at a Halloween costume and wasn't sure what it was at first? These puns are clever and will have people having "a-ha" moments once they figure it out. Instead of dressing your family as the cast of Stranger Things, dress up as Dr. Seuss characters and then add elements from the TV show like this family did with the string of lights. This Lisa Frank-inspired Halloween idea is both clever and creative. The pregnant mom is a gumball machine based on a work by Lisa Frank. The two daughters are Markie the rainbow unicorn and white tiger. While the dad's costume isn't based on a Lisa Frank work of art, it is equally as cute as the coin for the gumball machine. Sometimes you can dress your family up in entirely different costumes but still be coordinated. This family opted to stick to simple Halloween classic costumes all in a black-and-white color pattern. While a ghost might not necessarily work with a cat, in this instance it does. You can't go wrong going out into the neighborhood dressed as your favorite superheroes. These family costumes are easy to put together, even if you don't have great craft skills. Start with red shirts, pants, or tights, and then add the details with black, yellow, white, and orange felt. These adorable costumes are inspired by the book Where the Wild Things Are and are relatively simple to DIY. Fashion some wigs with horns and you're well on your way to recreating this theme. Do you think you can convince your family to dress up as a Care Bear family? If so, the entire ensemble will be easy to make by using appliques on matching sweatpants and hoodies. As a bonus, these costumes will be comfortable for cooler weather. Who can remember dressing up as Raggedy Ann or Andy as a child? Well, this classic isn't out of style yet. This timeless and easily crafted costume idea works well for families of two. To get started, find some vintage clothes at a thrift shop and then make the red wigs from yarn. It's all too fun for siblings to dress up as characters from this famous book series. To achieve the Hogwarts look, fashion some simple black robes and school ties. To get parents involved, think about how you can transform into your favorite adult, like Dumbledore or Snape. One way to take your costumes back a few generations is to dress as the characters from "Scooby Doo." Shaggy, Freddy, Daphne, and Velma looks can be recreated using thrift shop clothes and perhaps the right wig and glasses. Don't forget to make a dog costume for Scooby Doo and perhaps a little ghost costume for any tiny family members. Channel your inner troglodyte by dressing your family as some nomadic cavemen. To do this, get some animal print fabric for the costume. As far as accessories, craft some paper mache clubs, wigs, and a few bones to use in your hairdo. You can check "The Croods" or old Flintstones episodes for further inspiration. One fun way to dress your family up as the cast of Willy Wonka is to have the kids be the adults and the adults be the kids. One child can be Willy Wonka. Another can be an Oompa Loompa. Then the parents can dress up as either Veruca Salt, Violet Beauregarde, Augustus Gloop, or Charlie Bucket. Even the grandparents can get involved as Grandpa Joe and Charlie's other relatives. If you like costumes with a lot of intricate details, consider this next theme. Transform your family into Wonderland characters with wigs, face paint, and costumes. You have many characters to choose from, including Alice, the Mad Hatter, White Rabbit, Queen of Hearts, Cheshire Cat, and Caterpillar. One clever way to get dad involved without him needing to dress up radically different is to stage a shark attack. The kids can be dressed as cute little sharks who seem very harmless, and Dad is the surfer who has had a run-in with them. Craft a surfboard that has a bite taken out of it using cardboard. You can make this as edgy or as fun as you wish. If you have no plans to dress up for Halloween but want to take a fun family photo, consider this idea. Bring the book characters from Diary of a Wimpy Kid to life with printable masks, white shirts, and black pants. You probably have everything you need in the closet already, so you can put this together quickly. Have fun dressing up the whole family in the characters from the movie Toy Story. Woody, Buzz Lightyear, Andy, Mr. Potato Head, Mrs. Potato Head, Little Bo Peep, Slinky Dog, Rex, Hamm the Piggy Bank, and other characters provide lots of opportunities to be creative and provide many options for larger families. Dressing up as Star Wars characters doesn't have to cost a lot of money. If you're on a budget, use bathrobes and store-bought lightsabers and blasters to get the classic looks. For diehard fans, create a gorilla suit for Chewbacca or Ewoks and make robot costumes for R2D2 and C-3PO. Be warned, your family may fight over who gets to be Darth Vader. Peter Pan can easily inspire costumes for the whole family. Peter himself, Wendy Darling, Tinker Bell, Captain Hook, Smee, the Lost Boys (and even the Nana the dog) are easily adaptable choices. Play down on the farm by costuming your family as farmers, ears of corn, cows, pigs, and other animals and crops. This is a fun way to involve family members of all ages. Ask the grandparents to dress up as Old MacDonald and the Mrs.
Are your kids obsessed with video games? Put your crafting skills to good use to make costumes that represent the Angry Birds from the game. These birds are too cute to be too angry. To create your own family of bees, dress the kids as bees and make one of the adults the official beekeeper. This idea is especially adorable if the mother is pregnant and she dresses her womb up as the hive. This idea is great if you've run out of time and need to put together something quick. Break out the red and white stripes, beanie hat, and glasses to turn your family into a group of Waldos. These costumes are good for mobility when trick-or-treating, and you should be able to put them together easily without the need for craft skills. Parents don't need to transform themselves into magical creatures on Halloween. Instead, dress normally, then throw on an apron and a hat. Next, turn your kids into doughnuts that are almost good enough to eat. Mary Poppins has so many classic characters with such fun vintage style, and the newer release is a further inspiration. From a candy-striped suit to chimney-sweep makeup, you can have a lot of fun putting together these costumes. If you played Pacman as a kid, you might have a lot of joy recreating this costume idea. Dress the adults in cardboard Pacman costumes and the little ones as the ghosts. Once in costume, act out the game by having the kids chase you around the yard.